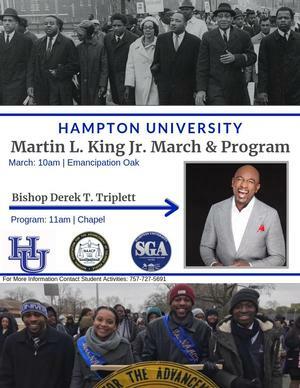 HAMPTON, Va. (January 18, 2019) – The Hampton University Student Government Association (SGA) in conjunction with the Office of Student Activities and the HU chapter of the NAACP, will host the annual Martin Luther King Jr. march and program on Monday, Jan. 21 at the campus. The student led march begins at 10 a.m. at Emancipation Drive and ends at the Memorial Church on campus. Immediately following the march is the University program honoring King in the Memorial Church at 11 a.m.
Rev. Dr. Jerome A. Barber, of Sixth Mount Zion Baptist Temple, will offer the program’s opening prayer. The keynote address will be given by Bishop Derek T. Triplett, the founding pastor of Hope Fellowship Church in Daytona Beach, Florida and CEO of Relate Coaching and Consulting, LLC. He has spent over 20 years in pastoral ministry and over 25 years preaching the Gospel in a powerful and profound manner. He is a life member of the NAACP. With a passion for community transformation and empowerment, Triplett serves the community in numerous civic capacities. He presently serves as chairman of the board for the Center of Business Excellence, a member of the Daytona Beach Rotary Club, The Civic League of the Halifax Area, and the City of Daytona Beach Economic Development Advisory Board. He is a graduate of Leadership Daytona and received the 2008 Halifax Area Chamber of Commerce Marvin Samuels Service Award. The program is free and open to the public. For more information, contact the Hampton University Office of Student Activities at (757) 727-5691.